Adding an Optional Raymarine's EV1 sensor (Sold Separately), Micro-Talk will compensate for vessel movement allowing for even greater precision. As a result of the acquisition of the TackTick brand of wireless instruments, Raymarine has officially announced their transition and reintroduction as Raymarine Wireless Instruments. Though the brand name has changed, the devices are otherwise identical to their TackTick counterparts in Form, Fit, Function and Appearance. 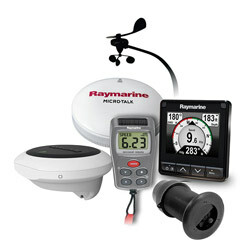 Like every other Raymarine product, Raymarine Wireless Instruments are backed by their industry leading 2 year standard warranty.